Many years ago I remember seeing Billy Connolly on his trike and I thought that looks like so much fun. I rode a motor bike in my younger days and stopped when my children arrived. John has always had motor bikes and I was content to be a pillion passenger. This all changed on Australia Day 2018 when I met Tracey, Lyn and Janet. We talked about how great it would be to be able to ride a trike and we decided to do something about it. Lyn and Tracey had their learners and they did the open licences together. Janet and I did a modified Q Ride course on our trikes to get our learners and then our open licence. Then the Awesome Foursome was formed. I love riding my trike and use it to go to the shops, just because I can. Others have said “now that’s what I call retirement” or even “living the dream”. I caused a stir at my craft class by turning up on my trike. The Awesome Foursome are members of the Ulysees Club and join their rides. A couple of weeks ago I was ride leader. This was a challenge for me, but all went well and it was a boost to my confidence. There haven’t been any female leaders before in the time I’ve been with the club so I was proud of myself. We are taking the trike and teardrop trailer to the United Trikers AGM at Merimbula in March. Triking is an opportunity to experience new things, have a great time ad meet new friends so ladies please give it a try – you can do it. If you’d have asked me a couple of years ago if I thought that I would be riding my trike as much as possible and loving every minute of it, I would have probably laughed at you. About 18 months ago Wayne (husband) and I discussed getting a motor bike and ended up with a Kawasaki Vulcan, lovely bike but just too heavy for his (older body) but this turned out to be the best possible thing that could have happened. He turned to the idea of a trike. This got me to thinking that I could probably do that too, as for many years on our farms I rode one of the old balloon-tyre Honda trikes, then onto a Quad, hell for leather through the paddocks, dodging trees, rocks, stumps, etc. I contacted Queensland Transport (QT) and asked how I could go about this. Due to major back damage leaving me with a weakened left leg I knew that going through the usual learner process was not possible for me. I simply could not balance a 2-wheel bike with my condition. QT were actually super helpful and I ended up with my learners. Australia Day 2018, Wayne and I were playing music for an Australia Day Event that the Gladstone Ulysses Branch supported and I was so fortunate to meet another three like-minded ladies. The beginnings of the Awesome Foursome. Tracey also had her learners and we ended up doing our open licences together and Sandra and Janet started their learners together then onto their opens. At that time, I had a 6 cyl Honda Valkrie, but soon went to an VW powered manual trike and at the same time Wayne got his automatic TOUROZ Trike. He was so impressed with it and the auto transmission, he wanted me to get into the auto as soon as possible, given my back injury and leg history. I was so glad he wanted me to do this, the best decision ever. Having the auto takes all pressure off my weak left leg and the comfortable ride is incredible. I can see me riding for a lot more years that I first thought possible. It has opened up a whole new world of adventure I didn’t even know was out there. What a difference a year makes. I continue to discover girls riding trikes is a common part of the modern life. Go Girls!!! Wayne and I are soon taking off (as soon as I get my tow bar fitted to the trike) on a ride to Darwin in the first week of March with both TOUROZ Trikes. His and Hers. White and Yellow. Wave if you see us passing by. Counting down the days. To celebrate my fortieth birthday, I got my motorbike learners and bought myself a Suzuki Intruder 250. I had a few lessons and all was going well, even passing semi’s. Yes, well it might have been when they were going up the Toowoomba Range, but still it counts. Then I dropped the Intruder and did a bit of damage to my knee and never went on to get my R class. My husband started looking at trikes and we bought a Black TOUROZ LT2 in July 2017. I was disappointed to find I needed the R Class to be able to ride the trike, felt I was missing out even though the ride is great on the Queen seat on the back. Through triking, I met some wonderful women from Gladstone who were all on a mission to get their licence on trikes. So on Australia Day 2018 we hatched a plan. 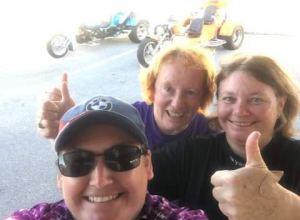 The QRide in Gladstone provided a course and assessment on our trikes and 11 years after getting my learners at the age of 51, I got my open R Class licence and we call ourselves the Awesome Foursome. I love riding the trike, my husband works away and now I can still jump on and go for a ride. I did the Hervey Bay Toyride this year which was great. The reactions are wonderful! The trike seems to make people happy, lots of people stare and wave and the best bit is, random strangers come over and start talking, there should be more of that in the world. Well it all started on April 24th 2017, when I first met Bruce. We met online, and when he came home for the weekend, he turned up on his trike. That was the day I fell in love with them both. lol. I told him I could see myself getting my licence to ride one of them one day and that was it. That is all I thought of every time I saw them. When I eventually moved to Gladstone, I thought to myself I’m going to get my licence and that is what I did. Bruce took me down to Dept Transport and got the forms I needed to take to the Dr to fill in, as I could only ride if a medical certificate was added to my car licence. I got my learners and ca-boom couldn’t get me off the thing. I absolutely loved it. I got a lot of riding experience when Bruce and I went to Darwin, Alice Springs then down to South Australia for the AGM. When we got home, another learner Sandra (Sandy) Watson and I did our course then after 5 weeks we got our open licences and we have not looked back. Then we met up with Lyn and Tracey and we became the Awesome Foursome and we have been riding together since. I am 54, and this is the best thing I have ever done in my life – money worth spending. I should add, my first big ride was from Brisbane to Gladstone on the back seat, I am surprised that there aren’t more women trike riders as it gives you the freedom of riding, as well as being more safe.